School District Shawboro Elem, Currituck Middle, Currituck H.S. Fantastic 3 Bedroom home on a large fenced double lot (approx 1/2 acre) giving plenty of space for the detached garage with added workshop, summer garden & outbuildings that this home offers. Large living room with newer carpet & wood burning fireplace. 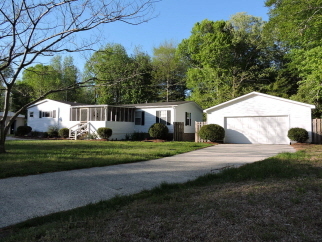 Country sized kitchen with loads of cabinets & counter space and newer laminate floors. Master bedroom with his & hers walk in closets and dual vanities. Bonus addition for office/REC.rm. Laundry with mud room boasting cabinets for extra storage. Lovely screened porch to relax in. Double driveway offers plenty of parking. Pay less than rent!